Without going into detail, the LGBT+ community has felt like a home and a haven for as long as I've known that such a community existed. 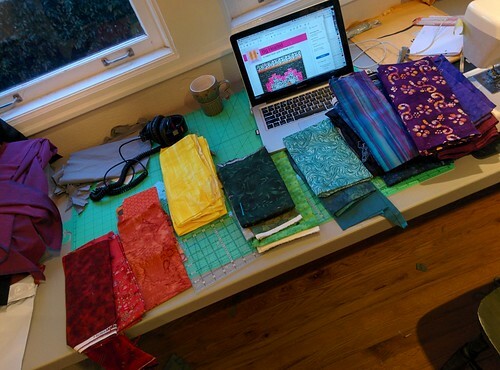 It's bothered me that I've made few attempts to articulate that sense of place in the craft I spend my time on, and Sam's variation on her pattern gave me an easy opportunity to raid my fabric stash and do exactly that. 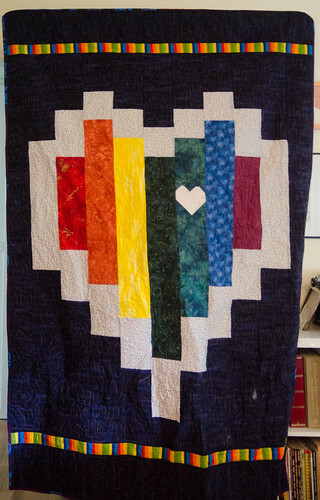 QAF was the first of the Pride-themed quilts I completed, though it was done almost wholly in tandem with This Heart Fights The Good Fight. The two quilt tops were cut in tandem, sewn in the same week, quilted in the same manner, use Marimekko backings I brought back from Denmark years ago, and were mailed out on the same day. They are fraternal twins in every sense of the word; change the background colors and the backing, and they are otherwise identical. Both contain messages that have meaning to the recipients. It's okay if you think it's a little over-the-top. (It is.) 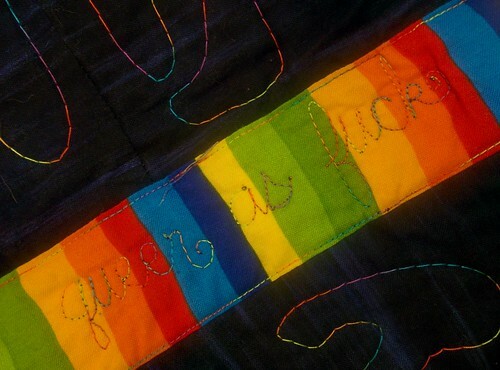 I personally think it's hilarious: rainbow stripe and rainbow quilting thread on a rainbow Pride-themed quilt? It earns its name, in my opinion, and you know what? Good. It was my previous quilt finish, Orangerie, which was for a coworker who had to leave his home country to marry his partner. Chew on that concept for a moment: you're committed enough to each other that you're willing to live in another country rather than not be together. That level of solidity and commitment in the face of legal hurdles is worth celebrating, not brushing aside. —and, so, Pride quilts. Because visibility matters. Because solidarity matters. Because finding solace and comfort in a chaotic world matters.